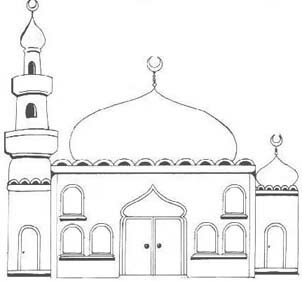 Make a copy of an Islamic Design, for example a drawing of a simple Mosque with a Minaret, like the one above. You can simplify it to the best you can,depending on the ability and age of the children. of the area of the windows in the diagram. Have children color and/or decorate with colored glitter. through it to hang from the ceiling.